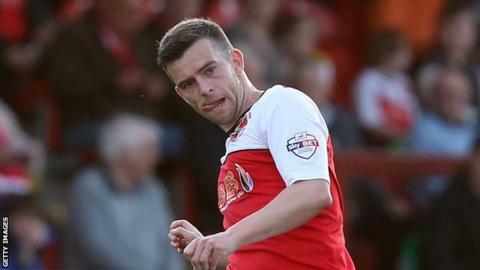 Stevenage signing Steven Schumacher has described his first meeting with new boss Teddy Sheringham as "surreal". The 31-year-old midfielder was the third of the ex-England and Manchester United striker's four summer recruits. "I looked at the chairman thinking, I can't believe Teddy Sheringham's making me a cup of tea." Sheringham was announced as Stevenage's new manager in May, leaving the West Ham coaching staff to take on his first managerial role. "At the moment he's calm and laid back, but I'm sure if things don't go well he could lose his temper," said Schumacher. "He's worked with the best, so I'm really looking forward to working with him." Boro reached the League Two play-offs under Graham Westley last season, and Schumacher, who won promotion from the division with Bury and Fleetwood in 2011 and 2014, is looking for them to do even better in the season ahead. "It's a new squad with new signings, so we're trying to gel. We have to take each game as it comes and try to learn from each other," he added. "Everyone's ready and raring to go, it's been a long six weeks."